Display product pictures with links in the store front to catch the customer's eye and direct them to special products in the store. Display different types of sales and promotions in product listing pages, product detail pages, or anywhere else on your store to increase sales. Display a number of related products on a particular product page for the customer to view and shop more. Display products that were bought by other customers who also bought the product someone is looking at that moment. This cross-selling feature could intelligently capture customer intent and behavior as they add products into their shopping cart and generate such targeted recommendations for them in a fraction of a second. Apply discounts based on purchased quantity of a product. The validation period of the discount can also be set. Bulk Discounts per Product can be offered using fixed price adjustments, percentage adjustments or set a fixed price for the product at a given period of time. With this addon you will be able to add labels, product images and icons to your products. You can add as many labels as you want. Setup a label and apply it to Featured, Bestseller, Latest, Special, Categories, etc. You can also add a label to show on stocks, or to show on products when they have got free shipping. All this work is done from one control panel. You will find out how easy is to create labels on real time preview, while you are defining label properties you are watching how it will show. Set different prices per product for each customer group (such as default, VIP, etc.). So when customers view the product page, the appropriate price is displayed based on the customer group they are in. Display special products with particular time or quality limitation options. This feature allows you to setup quantity of sales and a series of dates/periods to count to or from, in terms of years, months, weeks, days, hours, minutes, and/or seconds. Deal of the day (flash sales) is a type of e-commerce technique which offers a single product for sale for a period of 24 to 36 hours. Deal of the Day is a great marketing and promotional feature for your stores that gives you the ability to set up one deal per day, you can set multiple deals for the same day, or even schedule deals to span multiple days. And with social media capabilities enabled, you can leverage Facebook Like, Send, and Share this features for individual deals. Everything you need to run a Gift Promotion for your online web store. This extension comes with many advanced options to run many combinations of gift promotion. Increase your customer satisfaction and revenue using many combinations of gift promotions. This add-on will add gift product into shopping carts automatically. Want to give away a freebie when someone purchases something to increase sales and customer loyalty? Attract customers and increase loyalty by offering store credit points in new account registrations. Customers can view their credits from their account when logged in and redeem their credits in exchange for a product. Set a percentage based discount on a customer's current order based on their previous order. Ideal if you want to give your customers a reward for shopping more from you. Display specific products in pop-ups when the customer purchases particular products in order to maximize sales volume. With this contextual display of additional content it makes your online store look more intelligent and also gives your customers a genuine idea of other products that might be useful to them. ProductBundles is a MUST for anybody who loves cross-selling. Made popular by Amazon, there isn't anyone who will be able to resist your offer for bundle buy of products. Everyone has done it. You go to buy a book and you end up with 5 books and a DVD. The module will allow you to select products and pack them with a bundle. The bundles display once you one open a product page. Customers are able to instantly see the bundle and the savings that the special price will bring them. Fastest way to making more sales. Allows you to offer product discounts based on the customer's billing or shipping address (Geo Zones). This feature will display all the discounted prices of specified products to shoppers from particular regions. Allows you to offer product discounts based on the currency used by the customer. 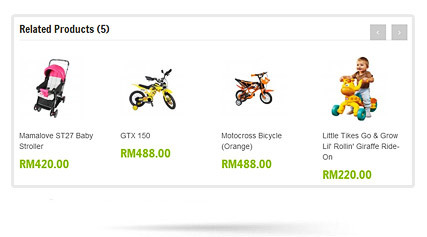 Once activated, this feature will display all the discounted prices set for that specific currency for the shoppers. Social Discount add-on specially designed to build social networking (Facebook and Twitter) community/fan base to rockets sale through spreading the word of mouth and also for future rich social marketing. Offer special discount (Fixed/Percentage) for liking social page of Facebook, following your twitter account and tweeting. Discount will automatically apply once they like, follow or tweet through your social networks. Easy way to promote your products and boost your sales by creating contest on your store (or on Facebook Store). Now you can promote your brand and products using Facebook Deal Unlocker.